The last time I wrote a blog post, Donald Trump had just become President of the USA, which pretty much prefigured the chaos and confusion of the last twelve months. But being on the door step of a possible nuclear obliteration is a good time to look back to all the joyful artistic experiences that made it from bearable to outright gorgeous. Since I lazily put together a short list of favourites from the last twelve months in response to Fiona Maddocks’ review, thought I’d publish them here with a few additions. In many ways it has been a remarkable year and have been very lucky to have been to so many stimulating performances. The programming of the Royal Opera left quite a lot to be desired for half of the year which brought down the number of performances attended considerably. Also managed to be at Semiramide on the night that Joyce DiDonato was unwell, which made it a rather staid evening. Sadly with the crazy prices I didn’t manage to see it another time. Also promised myself not to darken the doorstep on ENO until the utterly useless leadership steps down, I’m getting my wish next year so will be keeping an eye their way and hopefully see them make progress and who knows maybe one day they will manage to perform a bit more frequently as the current status quo is a long term road to oblivion. The smaller companies made quite an impact, Welsh National Opera was programming a lot of crowd-pleasers aside to more esoteric repertoire showing David Pountney’s capability in keeping a company in the black but also making sure it offers something for the neophyte but also adventure to the seasoned punter. Scottish Opera seem to be out of the woods artistically after a couple of challenging years. The two performances I attended were absolutely gripping, the appointment of Stuart Stratford is clearly making a difference. Grange Park semi-built a new opera house in the enchanted surroundings of a 17th century manor house, even if the dreadful Joanna Lumley was needed to cajole more money for their new toilets. Based on the description by Wasfi Kani I’m expecting a miniature Roman Coliseum with urinals. Over at Glyndebourne I managed to compress my three customary visits to a long weekend but was rewarded by some exceptional performances that even made me ignore the absolutely pointless staging of Ariadne auf Naxos that despite prior announcements, not many changes happened and we ended up with the most glorious singing in the service of a production that is both obvious and totally missing the dramatic arc of Strauss’ masterpiece. Holland Park Opera put another strong season with very well cast younger singers making their stage bubble with enthusiasm. •Le Grand Macabre with the LSO and Rattle in January was a fantastic way to blow away the cobwebs with Simon Rattle conducting a blistering account of this demanding score with a London Symphony Orchestra rewarding him with pinpoint accuracy and crystalline clarity. •Bryan Hymel’s blistering Turiddu and Canio on the opening night of Cavalleria Rusticana and Pagliacci at Covent Garden. When I saw him two weeks later he was even better! •Elīna Garanča‘s very intense and in many ways against the grain Santuzza was a revelation in Cavalleria Rusticana who added much needed nuance to this fantastic production. •Lisette Oropesa’s turn as Lucia bettered what can be done with Katie Mitchell’s production bringing clarity and vocal prowess. Her Lucia was young, but deep, and as far removed from pointless vocal pyrotechnics and “identikit madness” acting as possible. •The spectacular young cast including Natalya Romaniw, Jason Bridges and Nicholas Lester for Welsh National Opera’s Onegin was a joy, bringing back that most important ingredient of Tchaikovsky’s immense achievement, youth, to the foreground. •Lise Davidsen’s dark hued Ariadne at Glyndebourne was definitely a confirmation of great promise and an unforgettable evening. Her magical performance made us forget about the truly pointless production which deserves to be shelved without trace. •The unbrittled orientalism with a side of contemporary criticism for Cavalli’s Hipermestra at Glyndebourne made the unfamiliar accessible and gave a great vehicle for with many young singers, including Emőke Baráth, Benjamin Hulett, Anthony Gregory and David Webb making their mark. •The luxurious Magda of Elizabeth Llewellyn at Opera Holland Park’s La Rondine was balm for the soul on a warm summer’s evening. A tremendous singer that gives insightful readings of roles wrapped up with her sparkling personality. •The brutal Jenůfa at Grange Park was a great achievement, a true psychological thriller from start to finish. The intensity of Natalya Romaniw and the set chewing vim of Susan Bullock made this a true highlight of the year. •Another Holland Park triumph for the great singing actress Anne Sophie Duprels in Zazà. She is truly the house diva and she delivers in spades every time. Have never walked away from one of her shows less than shaken. Make sure you catch her when she returns in Mascagni’s Isabeau. •Brett Dean’s Hamlet at Glyndebourne was blessed with an amazing cast including Allan Clayton, Sarah Connolly and Barbara Hannigan. I was not quite as enamoured with the ridiculous writing for the Counter-tenors but the overall effect was one of a major new work that would benefit from some small revisions to make it dramatically even tighter. •Joyce DiDonato’s intimate concert at the Wigmore Hall with the Brentano Quartet was a suitably magical end to the year. A programme that included Strauss and Debussy was crowned by Jake Heggie’s song cycle based on the life story of sculptor Camille Claudel written for her in 2012. It was musical communication of the highest order, every breath mattered and it added meaning to every word. Have a listen to the two encores I recorded on the night to have an idea of the level of engagement and togetherness of audience and performer. Thanks for reading and I will wish you all a tremendous year ahead, even if we have to make even more concerted effort to make it so. It is this time of the year when eager press releases accompanied by expertly Photoshopped images start coming out of the Beeb’s press office. They concern the now regular Proms in the Park format that is happening concurrently with the actual last night at the Royal Albert Hall. Over time they have stretched the meaning of classical to breaking point by inviting musical stars and entertainers. This year a pair of old timers return, Miss Jenkins and Mr Boe. They endemically crop up as the star attraction at one of those arena classical pap nights and it still makes me wonder if the Proms brand means anything for the BBC. They keep promoting it as the premier classical summer festival (this year with an execrable campaign using the RAH as a glorified egg cup, see below) and then they contradict their own promotion by inviting popera stars to head those outdoor events. It is a very contradictory statement by the Proms bosses and it opens them up to questions of good management of a valuable brand that is slowly losing its hardwon reputation and meaning. There is always a discussion of what the programming of the season has to contain and how it should embrace the real world outside the classical bubble. By inviting Boe and Jenkins the BBC organisers are essentially making a statement of non trust to the very genre they promote. In the past they had no issues selling out the Hyde Park event with either Angela Gheorghiu, Bryn Terfel and Placido Domingo headlining. Now it seems they depend year after year on popular entertainers as if admitting defeat that bona fide classical stars can’t sell out the large outdoor venues. Ultimately isn’t the Proms brand about promoting and disseminating classical music to the widest possible audience, why do they feel the need to call on to people without the training or essential credentials? Boe and Jenkins will claim to have performed for the Proms without ever having to step on the platform of the Royal Albert Hall, a veritable own goal by the Proms bosses. When singers like Joyce DiDonato, who is singing for the RAH last night, do so much to bring a new audience to classical music and opera, an organisation of the size and influence of the BBC is seen as cowardly and predictable. 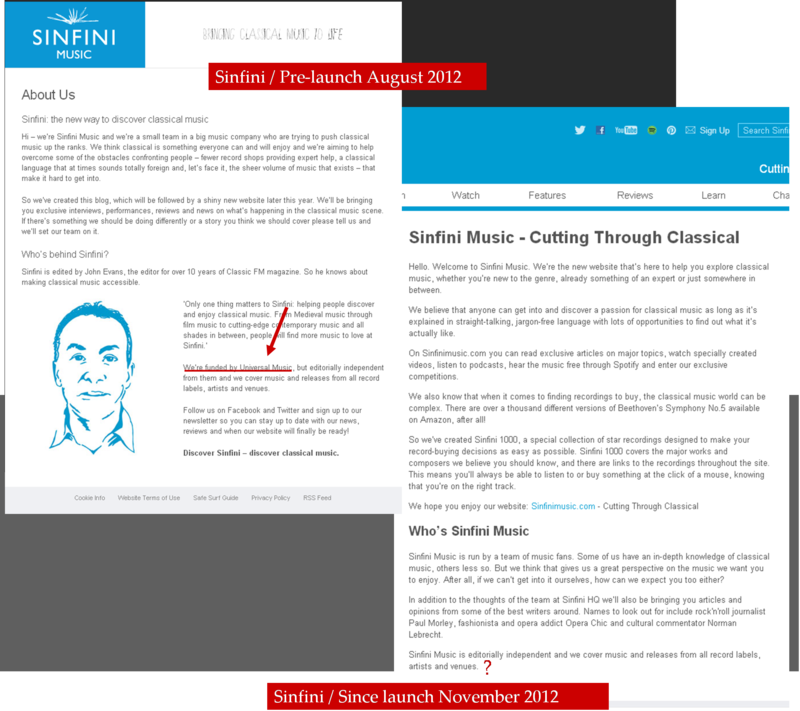 Since last November Sinfini has been trying to establish itself as a brand in classical music. Despite the loss of the ex boss of Classic FM magazine (itself extinct like the dinosaurs) John Evans, who quit to join the Sunday Times’ new online motoring project titled Driving. One of the most dire aspects of the site as launched where the Shrigleyesque portrait caricatures of composers and even the previous editor’s portrait (see below) did not escape that fate. They initially were all over the place but since have prudently been buried a few clicks away. Making it both an expensive mistake by Universal’s PR people and an indicator that they fundamentally misunderstood their audience. Another way they tried to subvert criticism of their funding model or the way the present themselves was to invite Norman Lebrecht, Opera Chic and Chris Gillett to write for them (presumably for no fee). By adding their names to the roster, in the process obviously silencing them if they had any misgivings about the ownership particulars or content (their domain is indeed owned by the record company and registered by the mega lawyer and financial services firm CSC). In essence giving the impression that their site is hosting bona fide blogs without an agenda. They seem to be happy to balance the expensive design of the site paid by record company hard cash, accompanied by professional videos and then to invite pre-existing bloggers to add a veneer of blogging credibility. Most importantly the funding status or for that any mention to Universal has been removed from the About section on the site. A new visitor to it would possibly mistake it for an independent voice “cutting through classical” but I am afraid that fig leaf can’t quite hide the fact that Universal bankroll them at the tune of millions. 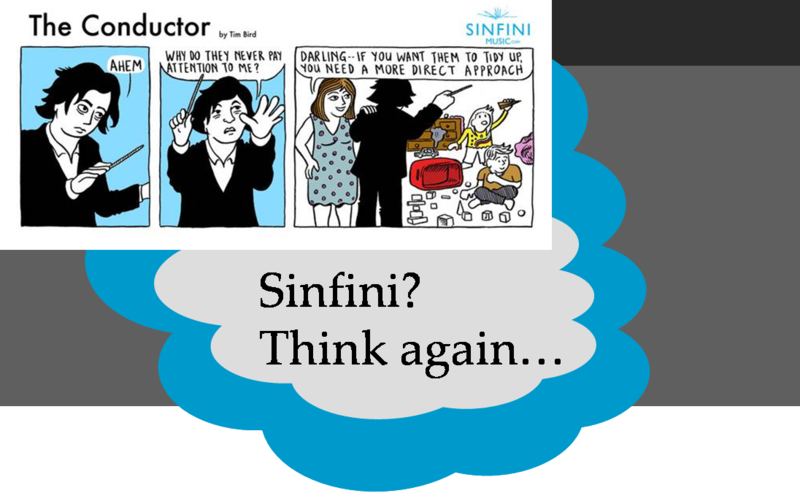 Being uncritical and accepting of Sinfini is not an option as it erodes the blogging landscape and will eventually drown the genuine, independent voices. See the graphic below for a comparison of blurb pre and post-launch. 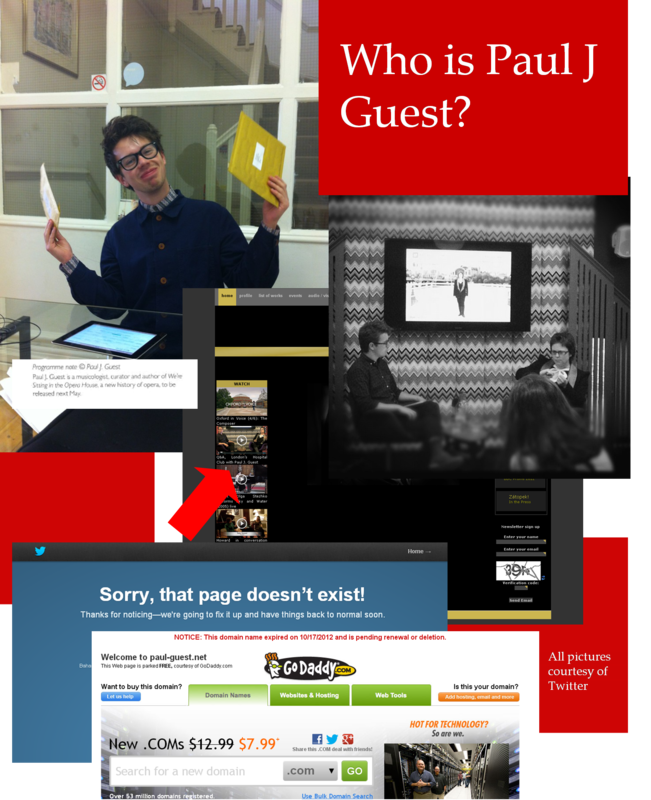 When challenged on Twitter both Messers Lebrecht and Gillett thought the ownership of the site did not pose a fundamental fault over its much vaunted independence. Conveniently they have both blocked me since we had the exchanges. We can’t oversee the ownership status of the site and its funding basis when it can potentially be there to push merchandise for a company that near enough is monopolising the field of classical record labels. After the recent acquisition of EMI/Virgin they have also Decca, DG, ECM, Verve and Philips/Universal. Having the crack dealer in charge of an anti drugs website would seem contradictory, we need to challenge Sinfini on why it deems it acceptable to have a record company funding it in a non transparent manner and without the slightest declaration. Owned by Universal, Sinfini describes itself as a site where readers can explore classical music whether they are “new to the genre or already something of an expert”. As well as articles, reviews and downloads, the site provides glossaries, timelines and guides explaining instruments, musical styles and the history of classical. I am making a stand because there should be a firewall between musical criticism/appreciation and the source of the music biz’s mindless PR…the record companies. Until Sinfini comes clean and drops the over-familiar nonsense about being put together by music fans and becomes more transparent about its ownership status and funding base, it should be treated as a merchant selling goods on the sly, burning money that a record company has put aside as PR spend. In my eyes it is a blatant experiment in perverting and subverting the well established blogging community in order to sell more merchandise and to perpetuate PR as matter of fact. For further entertainment value don’t miss out on reading the blog post by Norman Lebrecht on the launch back in November it is unintentionally hilarious and the comments below the line are an absolute hoot! Also I would recommend two polemical articles on the Blog On an Overgrown Path which are challenging Sinfini’s self promotion, content and marketing links and strategy with the Universal mothership. PS For those that find the above a personal attack on individuals, I will reiterate that my main concern is the dishonesty of this particular site. When papers like The Independent on Sunday stop arts coverage and fire their critics websites become even more important for dissemination of news, reviews and listening suggestions. Thus allowing Universal to be unquestioned on the subject seems like a very silly idea. Reading performing artists putting down their own audience never makes any sense to me. 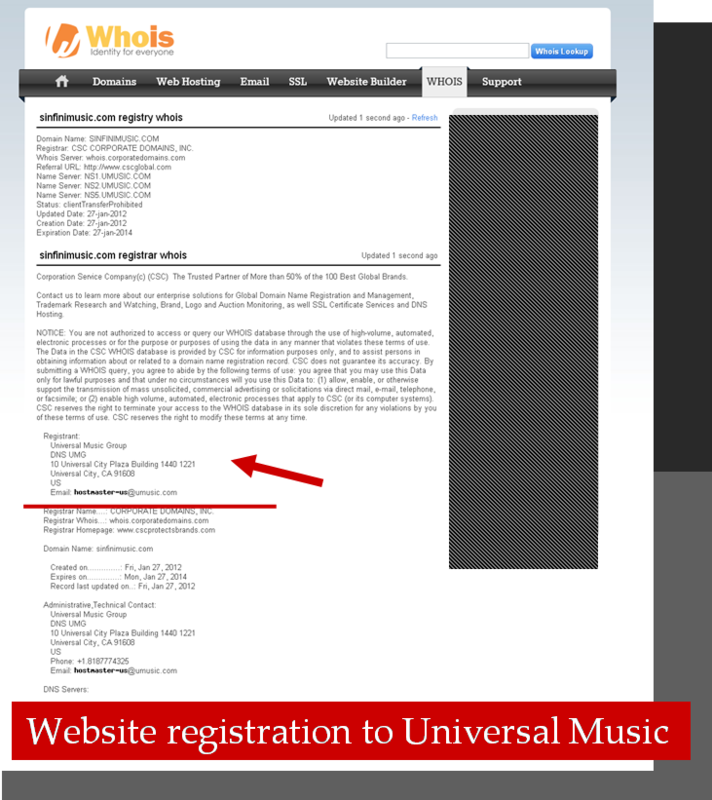 Chris Gillett wrote a blog post for Sinfini (the Universal Music financed quasi blogging effort. Apparently tasked to demystify classical music…). He explains his dislike for older prommers and their rudeness. I have mentioned many times my experience from the two Proms seasons I worked at the Royal Albert Hall as a Steward on Twitter. And I will make it clear that I am not the biggest fan of the ridiculous “sporting” element introduced by the hunt/cattle run for the front of the arena. A lot of the hoggers are smelly, unpleasant people who are there more to be seen than to listen. But they are a minority. His assertion that by abolishing the season passes the crowd would change or be magically younger/different is naive if not ridiculous. Who has the time to go and queue for the Proms? Only the unemployed, students or the retired (sons and daughters of oligarchs are invited to Grand Tier Boxes). So the demographic for the front few rows will look identical season tickets or not. His conclusion: Now, I’m no great fan of any movement that attempts to make concert-going more appealing to the young at the expense of the middle-aged and elderly. Why should the young have everything their own way? 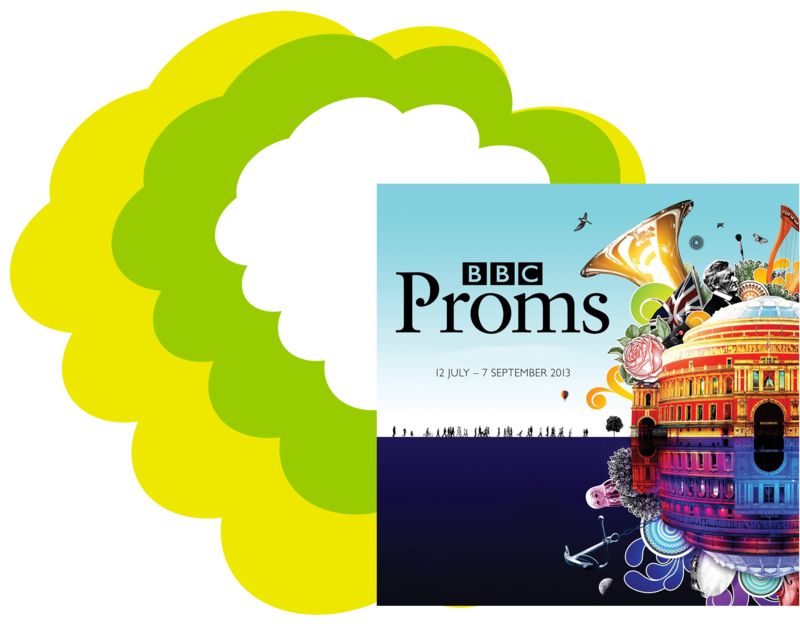 But I really think the Proms needs a shake-up, to break the stranglehold the ageing, die-hard prommers now have on this extraordinary festival. Seems totally over the top and verging on the disingenuous. The Proms may have many faults, including a ridiculous sense of self-worth but at least they are truly accessible with the £5 standing promming tickets. And I have taken the opportunity to see many great orchestras and soloists over the last decade for such a small charge. As a Steward I had to intervene many times when arena prommers verbally abused foreign visitors for not following their arcane rules, but this small minority that bullies newcomers exists in any closely-knitted group. Using such a minority as a shorthand to project our own ideas about what an audience has to be, leads us to some very predictable conclusions. Classical music circles get into a navel gazing mode rather frequently when they start pondering the older age of their audiences and overall access.The age of the audiences should not be the main object of fascination but the size. Orchestras, opera houses and concert halls should strive to bring in many people from whatever age and background. The senseless pursuit of a mythical group of youngsters that will instantly fall in love with classical and opera is a construct perpetuated by the very people who are meant to help make venues all-embracing in reach. Maybe the ulterior motive is that talking about age is much more convenient because it absolves them from responsibility in looking into their price structures and ticket distribution. Because the main two reasons for not going to concerts is the failure of music education in schools and the unreasonable ticket prices at certain venues. With the recession biting, potential audiences are very price sensitive. The Proms with offering nearly 1.000 tickets for £5 at every concert are giving a low cost entry to a world of music seen as unreachable or elitist. Can we celebrate this very fact and refrain from giving in to victimising the faithful punters that attend every season? Despite a wholly unsuitable venue and scorching temperatures the Albert Hall is near sold out for most events. Lets stop this self hating nonsense and wish Mr Gillett good luck the next time he steps on that stage as a comprimario or as a plaything for a new composer. Lets spread the love of good music and stop these nonsensical divisions and finger-pointing. It seems that pointing out to C G that ignoring the fact that he offended far too many people by being petty and presumptuous and avoiding to respond to any tweets addressed to him…made him unfollow and block me on Twitter. A little hissy fit that makes a great addition to this silly little attention seeking attempt from the grubby Sinfini site. In the last year I have met a lot of people in the classical music / operatic circuit one particular acquaintance was Paul J Guest, who I had chats with on Twitter and I finally met him during the Daniel Barenboim concert at Tate Modern on 8 April 2011. He seemed friendly enough but as the night continued he seemed fond of name dropping and clearly seemed as keen on networking as he was of hairspray. He told me he was dating a well-known indie opera director and that his day job was as a repetiteur for the Birmingham Royal Ballet, like with any acquaintance one takes that kind of info with a pinch of salt and not make the effort to cross-check them. As the months went past I noticed that his Tweets were changing their content and gave the impression that he was very well networked and was working for a number of online publications. I was thinking everything was going swimmingly for this fellow, he started writing sleeve notes for new classical releases, he seemed to be in demand for talks and even featured in a Proms programme. All this seemed too good to be true and in many ways showed how susceptible to chancers the classical PR circuit really is. A musician friend alerted me to a change of fortunes for Paul and how he was making claims that were proven from unlikely to outright false. That and his retreat from most social media made me want to investigate in a fairly detailed manner. Looking over a number of articles published by him one pattern came through clearly…in every single publication a new title will show up, a new claim to relevance would be made. Lets have a look at a few. Huffington Post: Paul Guest is a writer and playwright. Paul has written on culture for The Guardian, Huffington Post, Ceasefire Magazine, The Arbuturian and MUSO Magazine. His essays have appeared in programmes for the BBC Proms and Nimbus Records. Paul is currently writing his second play entitled ‘I’m A Stranger Here Myself’. 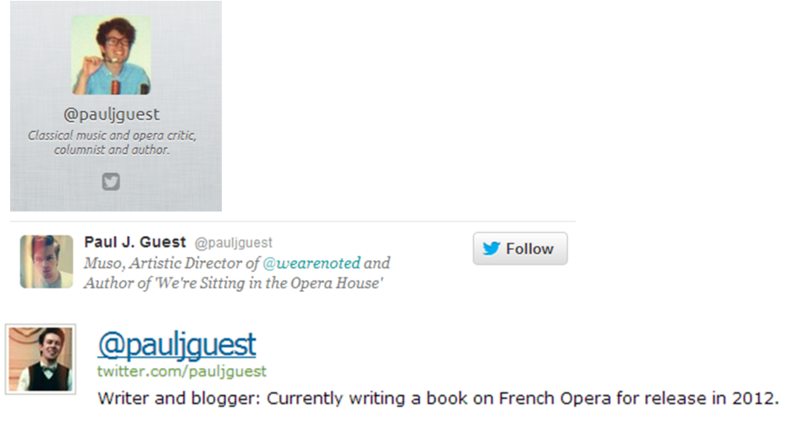 Ceasefire: Paul Guest is Ceasefire‘s Classical Music and Opera critic. He also contributes to MUSO magazine, WIRED, Classical Music Magazine, and is the resident interviewer at Opera Britannia. BBC Proms Programme for Prom 51: Paul J Guest is a musicologist, curator and author of We’re Sitting in the Opera House, a new history of opera, to be released next May. From the above you would assume he was in the process of writing a book and being a playwright and any other occupation under the sun. Now, why didn’t anyone question a 19-year-old being able to make such claims? Four weeks ago a certain PR agency that helped him get most of the gigs to date and a number of other professional supporters got an email from Mr Guest telling them that all his claims were false, that he only attended the Junior year of the Guildhall School of Music and he apologised reassuring them that he was getting help for his mental health issues. At that point it seems the penny dropped for all his supporters and also his website and Twitter account disappeared. Thankfully a number of his tweets are still archived online giving us an interesting insight at the kind of claims he was making online alongside all the rumours he was spreading in person. He would name drop as if his life depended on it, pretending to work for the Royal Opera, the Royal College of Music amongst many more claims. Shall we look into some of them? He was more than happy to insinuate on twitter and to blatantly tell acquaintances and new friends that he was working for the Music Director of the Royal Opera, Antonio Pappano. After another phone call to Pappano’s assistant we were told ‘That name means nothing to me‘. He also claimed in writing (and on occasions bragged in person) that he had interviewed Pappano. A couple of emails later I was assured by the Royal Opera’s press office that they had no record of him interviewing the MD. I searched for such article to no avail. He told a lot of musicians that he was conferred a FRCM (fellow of the Royal College of Music). Again another phone call later and a quick browse at the publicly accessible list, the only person on it with the surname Guest was a Douglas Guest who was awarded the fellowship in 1964. He claimed at times that his day job was as a repetiteur (as he told me face to face) at the Birmingham Royal Ballet. Again a swift look at their website disproves that claim rather easily. His name dropping skills were extraordinary and overall shameless, I contacted a number of important figures in the Classical Music world only to get confirmations that they had no idea who Paul J Guest was. I enquired about his self-identification as a musicologist and as an author by emailing the editor of the BBC Proms programmes only to be told that he was commissioned to write the article due to his familiarity to Emily Howard’s music output. I was told: ‘The author’s credit was supplied by the author‘ which seems a bit strange for the Proms not to look into the credentials of the commissioned writers. But at least in retrospect this programme entry can be seen as the swan song of a man who took advantage of a lot of people on the back of the current PR trend for the cult of youth in the classical and opera world. Paul must have seemed like the perfect ambassador to carry on their ideas of renewing the frumpy old world of classical, one funky haircut at a time. Here’s a recorded interview between the composer Emily Howard and Mr Guest.